I've been spending about an hour each day perusing through your magnificent library. (You must have given yourself a great chuckle, when I asked you to make hard -copies. THAT would certainly have exceeded Canada's GNP)! I think it's time to replace the forward hatch cover and aft hatch cover SEAL STRIPPING! Should I go to Abbott Boats or get some material from a local supplier? ... I would get the weather stripping locally. I seem to recall someone suggesting the stuff they put on car doors to seal them as being good stuff to use? I know we once had this in the Weekly Whiffle but can't find it in the WIT. Eeek! A gap!! PS: This gets you into tonight's Weekly Whiffle. Perhaps it will bring hatch seal suggestions out of the woodwork. Will also copy some possible advice sources. I ordered a few rolls of neoprene rubber from Porter Brothers a couple of years ago. As things turned out, it fitted only the newest built Porter boats. Over the years, several sealing rubbers have been used by different builders and even by the same builder. The position of the fasteners was adjusted to the thickness of the rubber seals. I once tried bending the fasteners to match a thinner seal thickness but failed miserably. The hard way: Move the fasteners to match the new seal thickness and repair the old holes with a gelcoat repair kit. The easy way: Take the old rubber off, go to a local hardware store and try to find some rubber seal with the same thickness. If your hardware store has nothing to match, they usually can order some or direct you to a company that can help you. Whatever you do, do not try to bend the fasteners to match a different thickness. It will lead to one thing only: you will need to go out and buy new fasteners as well as new rubber. Been there, done that! If all else fails try these guys: http://sealsdirect.co.uk/ They have been supplying the UK Wayfarers. They are located in the UK but I am sure similar companies are to be found closer to your neck of the woods (try Google). 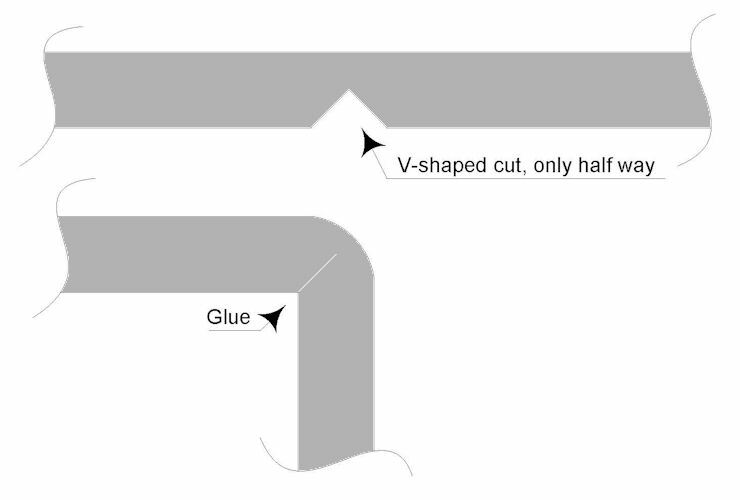 - In the corners make a V-shaped cut out, half way the width of the seal (see drawing below). - Use a contact glue suitable for (neoprene?) rubber on the corners and also to join the ends. - Do not join the ends in a corner. - Use the same reliable contact glue to fix the seal to the boat or hatch even of it is an already self-adhesive seal. The glue of a self-adhesive seal usually sticks to gelcoat as well as it sticks to its protective cover paper! - Make sure the contact glue is for use with rubber and stays elastic over the years. A glue that gets rock hard will start to leak after a while, or worse, the seal could come off. - Follow the instructions on the glue package to the letter. Specially where it says "Remove all grease with a solvent" and "Wait at least ten minutes until the glue is nearly dry". Yes, we did discuss hatch seal material in the past. There were several suggestions, but my source is Canadian Tire. There is a large selection, but Jack should use the black closed cell foam tape. It is durable, workable and provides a good seal. Due to the selection of widths and thickness, he should be able to find one that is equal to or better than what was there before. It is best to avoid the type of foam tape used to seal between the box of a pickup truck and the cap – it tends to “squish” but does not quickly rebound, leaving a poor seal on hatches; you need the type that is resilient and quick to recover its shape. I believe West Marine sells it, too. It is available in different sizes. I believe I used 91% rubbing alcohol to remove all the old gasket's adhesive residue before installing the new material.